The above painting is titled At the School Door. It was painted by Nikolay Bogdanov-Belsky, who was a member of the Peredvizhnik movement. The Peredvizhnik movement, or “wanderers” when translated, were a group of Russian artists that strived to depict the dichotomy of class and struggle that plagued Russia in the latter half of the nineteenth century. They did this through artistic realism that focused on both the beauty and brokenness of tsarist Russia. The Wanderer’s saw their inception in 1863 when they refused to enter the Russian Imperial Academy of Art’s annual gold medal competition. Fourteen students believed that the academy should focus more on the real, contemporary life of the people of Russia rather than “history paintings” that had become the norm. The fourteen wanted to part with the Greco-Roman standard of art that had taken precedence in Russia and paint the real and the nitty-gritty day-to-day life of their beloved country. They believed they could express the unique nature and diversity of their contemporary Russia through ultra-realism while displaying pride in the natural beauty of their country. “At the School Door” is an excellent example of the divide in social class in Russia. 1861 saw the liberation of the Serfs which brought many of the preconceived social normalities that had been a staple of tsarist Russia tumbling down. By the advent of the above painting in 1897, the former serfs now made up a distinctly poor class within Russia. This painting is a powerful example of how so many in Russia at this time were together, yet separate. Tsar Alexander II put into place many social reforms that were designed to bring equality to his people, he, unfortunately, drastically missed his mark. While the boy in the painting may be “free” in the sense that he is no longer the subject of a master, lord, or land-owner, he is not free of the social hierarchies to which many were still a slave to. The former serfs were able to scratch half a living off the land, however, they were, at all times, right under the more privileged of Russian society. 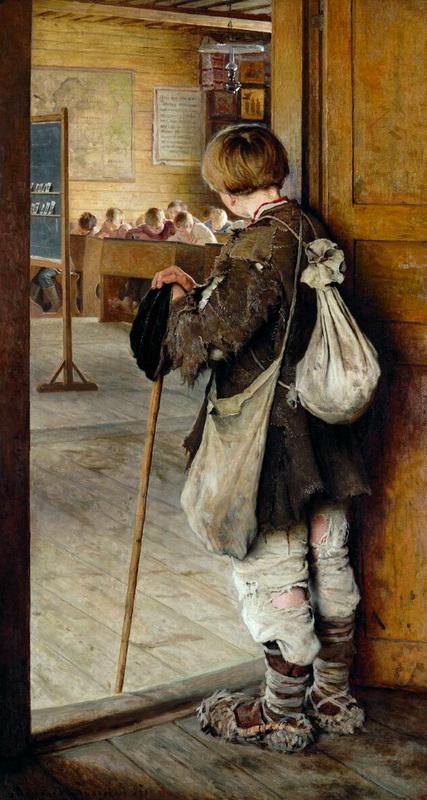 The boy in the painting is toting two bags which, more likely than not, contain all that he owns. His clothes are ragged, his posture is stooped. Just beyond that door frame sit a dozen or so well dressed, well fed children of age similar to his. The boy is wearing ragged cloth and wool foot raps and holding a walking stick. He has very likely traveled many miles from the barrens of the Russian taiga to sell what few crops his family can spare. One can only imagine what must be going through his mind as he sees these fellow youngsters warm in a schoolroom learning to write, learning to read, being equipped for a future in a society that has every potential of granting them wealth, fame and power. Meanwhile, in the boy’s world, all his future holds is cold, hunger, and the hope that one day he may rise above the conditions and spend a fleeting moment in the warmth of that schoolroom. Bogdanov-Belsky is able to masterfully convey the hardships that the peasantry of Russia faced in this one painting. The painting is perfectly aligned with the standards of the Wanderers displaying the fissure between the peasantry and the upper estates while breaking with “mainstream” Russian art ideals. The work is simple, yet deep and offers a window into a life that was so vastly different from the ease of post-modernism it is difficult to fully comprehend the struggle and gap between the boy that stands at that door and the children in the classroom. Though they may only be a few yards apart, they may as well have been born into different worlds. The painting’s realism brings to life the reality that was the rift between rich and poor, warm and cold, fed and hungry. Russia may have started its path to class equality, but it would still be some years until the socialist dream was realized. Until that day, the poor stood at the door and while they may have knocked, no one was willing to let them in. If you want to view the source material, find out more about the Peredvizhnik, or view more of their many works, check out the links below! ‘I really enjoyed your post and this painting is stunning. “I stand at the Door an knock is a perfect example of the detail that the wanderers brought to their paintings. what I particular like about this paintings, something you touched on, is how the boy, even thought he is forgotten and poor, still comes to learn, and I think that was the inner cry of many lower class Russians during this time. they were not forgotten in their minds and amidst the swelling political tension, the Wanderers were able to tap into the inner thoughts of my trod upon citizens with their work. Shame was the first feeling that came to me upon my first glance at this work of art. The painting is so simple, but yet voices a huge message. Social life is much different from life on paper. Childhood is important for development in people, and a childhood like this is one no one wants. You found a really great painting! Yes to Luke’s comment! And thank you for such insightful commentary on how the picture engages the broader social transformation (and struggles) of the post-emancipation period. I really enjoyed reading this!